We have been so busy getting ready for the Fall.I keep picking up pieces here and there whenever something catches my eye. We all know that once the weather actually gets colder, bikinis will be in stores for summer. WHY DO THEY DO THAT TO US?? I’m in a panic! Searching for snow-pants and rain boots before it’s too late. 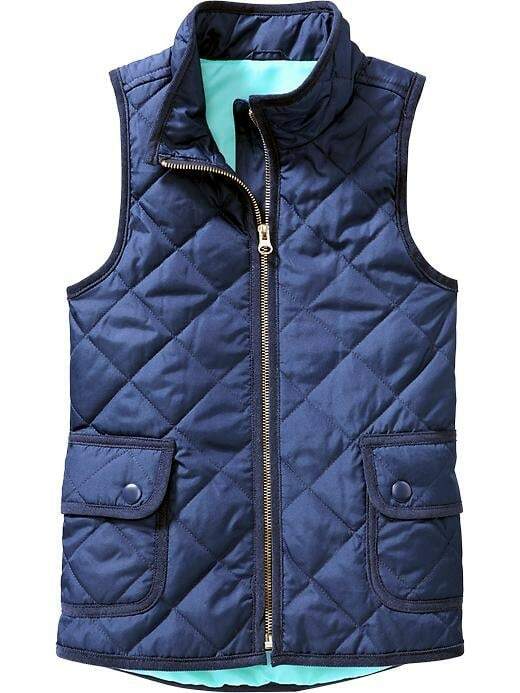 One of the items that I scored was this Old Navy Girls Quilted Barn Vests for Natalie. I want it in MY SIZE. I love this particular color (which is Goodnight Nora in case you were wondering), but it’s available in several more. Retails for $29 but you know that Old Navy ALWAYS has some FANTASTIC sale going on. Get it while the getting is good.